A little research for my BMW R 1100 GS and KTM 200 EXC Heated Grips! Oh well... BigBro is watching ya: Just out of the fun of it... What it'd be to have warm hands during those winter rides?! First of all, I had this catalog in print from the nice guys at Aerostich mailed to me. It was there that I first came up with the idea of warm hands... A nice idea indeed! Hot Grips are among the most popular grips in the internet, at least! They cost $110 and can be applied to all airhead, oilhead, K-models and F-models. However, Aerostich have them advertised at $87. Pick your choice!!!! Custom Heat Inc make heated grips for every bike manufactured. (See how they are installed on a BMW R1100RT, below). 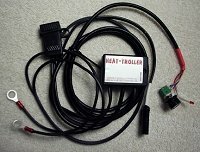 Heeters.com offer various sets for motorcycle and ATV evaluations. The ones in their site are of the 1 in. variety, and cost about $119. 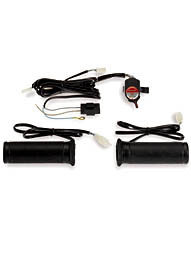 Bits-a-bikes from UK have these Griptronics heated grips which are open ended (for bar-end-weighted bikes), draw 1.5A, are 22mm in diameter and cost 39.99 GBP. 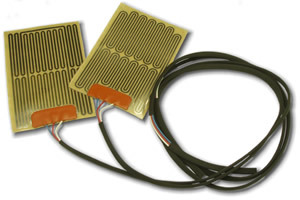 Newtronic Systems LTD from the UK have their own heated grips system. they will fit most bikes with 22 or 25mm handlebars, are self regulating and consume as little as a stoplight bulb. Prices range from 41 to 53 GBP. dexdirect.com sells the Motrax grips. Same spec (and same price and pic!) as the griptronics above. 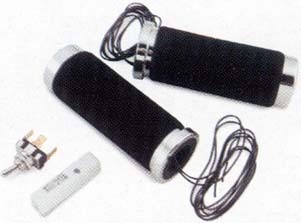 Dual Star have these heating elements, rugged, simple and effective, which stick under your grips. the price is cheap too at $29.95 but they ship only to the USA and Canada, currently. If otherwise, you have to get into some sort of paper/faxing "troubles". This device can be made to work with almost every kind of heated grips, and provides a good temp ranging. 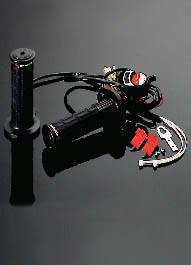 Hein-Gericke offer two sets of heated grips. The basic goes for 19.95 GBP and the Daytona for 42.95 GBP. Mind you this is the English speaking site of HG. If you wish for the German site it's at www.hein-gericke.de. In the English-speaking site, in the Menu go to techincal/accessories/optical tuning. Installation methods on various bikes (All VERY useful reading). Original BMW heated grips kit installed on a BMW R1100RT. 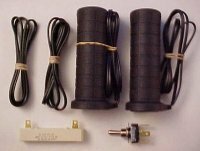 Make your own heated grips very cheaply! Joerg has the answer! (and in case you cannot read German, like me, try this link for a comprehensive translation into English. There's more interesting stuff in this site). 1: All detailing in this page, like specs and prices was taken from the original sites, with good faith! I've yet to try any of these products! 2: All links will open a new window, so don't be surprised if your popup killers start buzzing! I'm using a good ol' text editor to make these pages, so there's not really any hidden treasures underneath, except for my silly old counter. And that's for the fun of it, really!